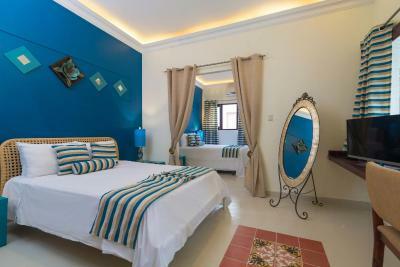 Lock in a great price for Casa Sanchez Boutique Hotel – rated 8.5 by recent guests! Amazing staff!! So friendly and helpful. Great location. Good breakfast. Great stay. Extremely friendly and helpful staff! They really go the extra mile to take care of their guests. The place was super comfortable, clean and equipped with air conditioning, wifi, small pool and great rooftop terrace with a hot tub and space to hang out. 4 choices of breakfast on the patio around the pool - very nice. I loved that it was in walking distance of Calle Conde and all the sights in the colonial zone. I was traveling alone, and I felt very safe being out and exploring by myself. This is not a corporate luxury hotel where guests are anonymous. You will feel very well taken care of at Casa Sanchez! Large apartment (we had the 4 person room with kitchenette). [Note: Bookings.com map location is not correct by several blocks south ... however, Google Map (and Waze) location is correct ... and in better location of city.] Intriguing facility with a maze-like path to our “Britannia” apartment (note: no room numbers). Free bottled water dispensers every where. Many nooks and crannies. Enjoyed the pool and Jacuzzi. I liked that the staff were extra helpful. The location is great in the colonial district with lots of areas to see. The staff were very kind and helpful. The bed was very comfortable. The grounds were nice, but a bit shabby. The staff was AMAZING!! Nilda was sooooo sweet as was all the staff we interacted with. This hotel will definitely be my first choice when I go visit again. the room was well equipped. parking available. secured. walking distance to many things. The room was great and very comfortable and the location was perfect. Loved the breakfast! Casa Sanchez Boutique Hotel This rating is a reflection of how the property compares to the industry standard when it comes to price, facilities and services available. It's based on a self-evaluation by the property. Use this rating to help choose your stay! Set in a historic building in Santo Domingo's Colonial Zone, the adult-only Casa Sanchez is within 1 minute's walk of Conde Street. This boutique hotel has an outdoor pool, a rooftop jacuzzi and free WiFi in all areas. Each air-conditioned room comes with cable TV, a safety deposit box, and a luxurious private bathroom with top of the range bathroom products. The colonial rooms have an array of original features including tiled floors and high ceilings. 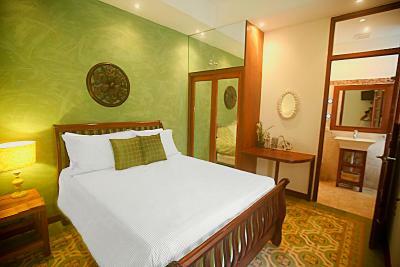 The standard rooms are more modern and slightly larger. Casa Sanchez offers private offices and meeting rooms, as well as a cafe and a computer lounge. The property also has access to a fully equipped gym close to the hotel, which is free for guests. Breakfast, lunch and dinner are offered in the restaurant with garden views, and feature different options such as international and Dominican dishes. Room service is also available at the property. The Suite with Balcony has its own kitchen for guests who want to cook at home, with a supermarket just 3 blocks away. Boca Chica beach and Las Americas International Airport are both within a 45-minute drive. Free public parking is available on the street outside the hotel, while a private parking space can also arranged. The adult-only property offers airport and local transportation for an extra fee. 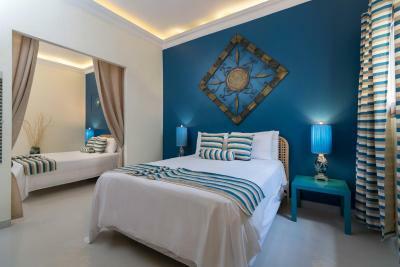 When would you like to stay at Casa Sanchez Boutique Hotel? 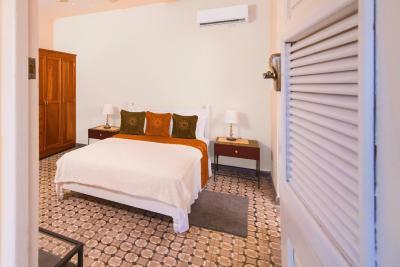 Located next to the pool and featuring original colonial features including beautiful mosaic floors, this air-conditioned adult-only room is equipped with a flat-screen TV and free WiFi. The large bathroom includes a walk-in shower and a dressing area. This adult-only larger, modern suite has a comfortable seating area and is fully air-conditioned. 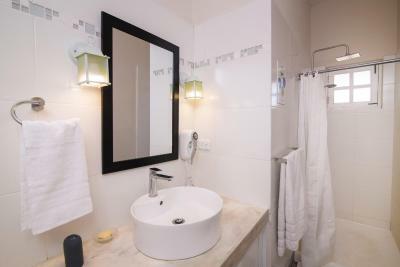 It offers free WiFi and a private bathroom with a large shower and toilet. This suite is in a modern part of the building and does not have colonial features. This air-conditioned adult-only room has a flat-screen TV and free WiFi. It also features a private bathroom with a shower and toilet. This room is in a modern part of the building and does not have colonial features. This spacious adult-only suite has stylish, modern décor. It features a large double bed in the bedroom, a separate seating area with 2 single beds, and a kitchen. The balcony overlooks Sanchez Street. This room is air-conditioned and also has a fan. It has a flat-screen TV and free WiFi. There is a bathroom with a shower and toilet. This double room has a tile/marble floor, patio and hot tub. Hotel surroundings – This neighborhood is a great choice for travelers interested in architecture, museums and history – Check location Great location - show map Guests loved walking around the neighborhood! House Rules Casa Sanchez Boutique Hotel takes special requests – add in the next step! Casa Sanchez Boutique Hotel accepts these cards and reserves the right to temporarily hold an amount prior to arrival. The staff is so kind. Don’t get the room next to the kitchen. Very noisy! Sometimes the internet wasn't working. The hotel itself was very homey and all the staff were friendly and very outgoing. The entire experience was very nice. I would recommend it for people traveling with their partner, or for work. The assigned parking was down a narrow path and into narrow covered spot. Loud fridge in the room which we had to unplug at night. We liked almost everything. The cleaning and care for the room and fresh toiletries was superb! The staff was really helpful and nice! The staff were very friendly and supportive. Caren was the best. The place is very charming - an old Colonial mansion converted into a hotel. Comfortable, quiet and safe. There is a pool, jacuzzi and access to a gym opposite where I got to meet some great local guys. The staff are some of the best I have seen in DR. WiFi works well (can be an issue in DR). Right near the Conde, restaurants and Colonial Zone sites.